Perhaps street creditability is a bit strong a term for this car, that seems to have the looks that will sell itself…and deservedly so as Volkswagen has clearly created a character car that is also practically sized in all respects. Initially where the up! (crikey, what a name!) scores is in its front seat accommodation combining generous sized seats with easy access. Admittedly the 3-door body means that access to the two rear seats is the usual agility test though the rear seat comfort is actually very good, leg room more than passable but really tall torso passengers might find a lack of headroom. Boot capacity, without resorting to flattening the 50/50 split folding rear seats is incredibly generous. Thus the up! body design has obvious appeal to the less able older user, also as a second family car with small to medium sized children and potentially perhaps as a first new car for a young driver…insurance is a lowly 2E. Clearly the right credentials to notch up strong sales. The body styling is cute that with not much customising could become trendy, the frontal aspect highlighted by a distinctive nose that does without an obvious grille while the rear has a one piece glass tail-gate that is clear for the rear window and opaque black for the remainder. My only thought is that any rear end damage would mean a complete new glass panel. Inside it is fitted out to the usual exacting standards I expect from Volkswagen products, the fascia highlighted by a large instrument containing figured conventional dials while the bright metal embellishment is abundant and the actual scuttle panel is finished in shiny carbon fibre which some of my regular car observers liked, other not so keen. With an obvious demand to make a small car do more or less the same tasks as a larger model, the driving position is critical and I think the driver comfort aspect on the up! rates as excellent. The front seats are high backed with built-in neck supports. The adjustment range is capable of coping with a variety of occupant sizes and despite the steering column adjustment having rake but not reach adjustment it should be possible to achieve a comfortable situation; pedal positioning is also well spaced. Power is provided by a new petrol engine employing three cylinders and driving through an easy changing five-speed gearbox. Initially the engine sounds noisy and has that distinctive exhaust note of this type of engine if high engine speeds are employed. Power output is just over 73 bhp or 75 ps which appears plentiful for this relatively light and slippery shaped car. Volkswagen claim a top-speed of 106 mph with 62 mph (100 kph) reached in 13.2 seconds with a combined fuel consumption of 60.1 mpg that suggests to me that day to day around town driving should see about 50 mpg. An emissions figure of 108 g/km needs to be trimmed below the 100 mark to optimise running costs. The driving characteristics combine easiness with responsiveness, a generally refined ride with an occasional bump stop feeling when encountering poor road surfaces and there is just a suggestion of body lean if cornered hard. Stability is a strong point giving the feeling that it would be hard to be blown off course under strong wind conditions on open motorways while the response though the light acting steering is precise, the braking action very competent and the clutch actuation none too heavy. I tested the top High up! Version that really packs in a lot of big car kit that includes all the electronic driver aids like traction control, a comprehensive air bag system, a very sensible plug in scuttle mounted Maps & More satellite navigation system, Blue Tooth infotainment, manual air conditioning, powered front windows (only one switch per door side) MP3 compatible CD, heated front seats, electrically heated/adjustable door mirrors, tinted glass, alloy wheels and more. There are also some sensible options, the test car including a panoramic opening sun roof with bug visor, a Driver’s Assistance pack that includes city emergency braking and, would you believe? a full sized spare wheel for £50. Up! also comes with a high scoring 5-star Euro NCAP rating. 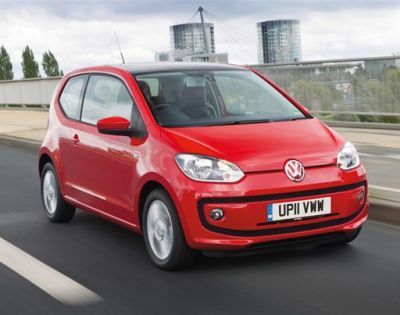 I don’t think, I know, Volkswagen will further up its sales with the up! SOME RIVALS: Skoda CityGo, Kia Picanto, Toyota iQ 1.0, Fiat 500, SEAT MII SE, Ford Ka. On road price from £10,515.